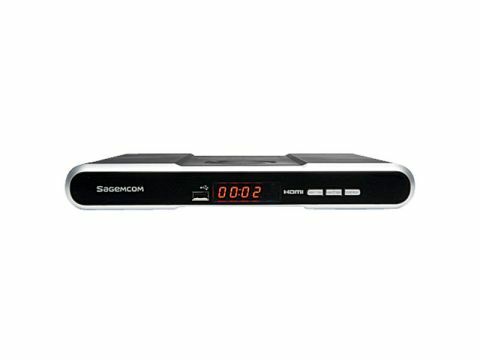 The Sagemcom DTR67320Tx slimline Freeview+ recorder confounds expectations. A cursory glance may suggest it has little to offer beyond basic standard-def timeshifting, as it doesn't have DVB-T2 tuners. However, Sagecom apparently believes that's no reason to deny folks additional functionality. Slight, with distinctive rounded corners, the DTR67320T un-selfconsciously plays the whimsical design card. The front panel display is a rather lurid orange. In standby the time is displayed, which then changes to channel number when the device is powered. The rear panel offers two Scarts, an HDMI output, optical and coaxial digital audio outputs plus component video. If you select the latter, you lose RGB from the Scart. There is also a USB port on the front fascia for media playback. Not only does this display high-resolution JPEGs, but it also plays MP3s with album art. The remote control is a generic grey zapper. Keys need a determined press, but it gets the job done. Installation proceeds at a leisurely pace, but without undue complication. Intriguingly, this little fellow can upscale its standard-def HDMI output to 1080i. There's a variety of output settings on offer: 576i, 576p, 720p and 1080i. It's not possible to scale the component output, though, which is fixed at 576i. The electronic programme guide is also a cut above. It features a live TV window so that you can stay in touch with your chosen telly while you peruse the eight-day channel listing. This can be scoured in either List or Grid mode. As with most modern PVRs, the unit runs extremely quietly. With dual Freeview tuners on board, two channels can be recorded at once. The hard drive is a moderately large 320GB, enough for around 160 hours of TV (one hour of recording time equates to between 2 and 2.5 hours HDD space on this machine). The DTR 67320 automatically records a two-hour buffer. So, in addition to pausing live TV, you can shuttle back through the cache to find something you may have inadvertently missed. The recordings library can be filtered by genre (movie, news, children, music, etc) or title. You can also create folders for better organisation. Video files can be renamed or merged, or even exported onto a USB device, as .TS files. Once moved to an external drive, I found I could play them back in a compatible media player without issue. This level of versatility really does give Sagecom an edge over rivals. he DTR67320T is not just a recorder, it's also a media jukebox, capable of playing JPEGs and MP3s, as well as import or export them to and from USB. Artist, album, title and genre metadata on MP3s can be edited, while images can be zoomed or rotated. I transferred over an MP3 album to the DTR67320 and, once resident, it could be accessed and played, complete with album art. Snaps can be played as a slideshow with musical accompaniment, beit an MP3 on the USB stick or on the hard drive or a Freeview radio station. Overall, this Sagecom is exceptionally versatile. Feature wise, it leaps ahead of its immediate competition and image quality is good. Given the price, we rate this miniscule machine as a bit of a steal.